The human genome is diploid, that is each of its chromosomes comes in two copies. This requires to phase the single nucleotide polymorphisms (SNPs), that is, to assign them to the two copies, beyond just detecting them. The resulting haplotypes, lists of SNPs belonging to each copy, are crucial for downstream analyses in population genetics. Currently, statistical approaches, which avoid making use of direct read information, constitute the state-of-the-art. Haplotype assembly, which addresses phasing directly from sequencing reads, suffers from the fact that sequencing reads of the current generation are too short to serve the purposes of genome-wide phasing. Future sequencing technologies, however, bear the promise to generate reads of lengths and error rates that allow to bridge all SNP positions in the genome at sufficient amounts of SNPs per read. 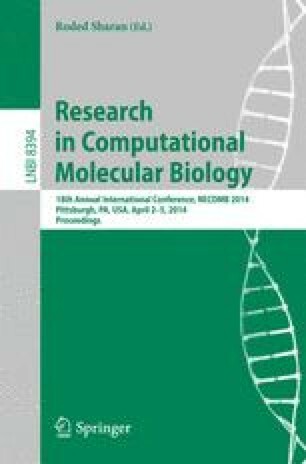 Existing haplotype assembly approaches, however, profit precisely, in terms of computational complexity, from the limited length of current-generation reads, because their runtime is usually exponential in the number of SNPs per sequencing read. This implies that such approaches will not be able to exploit the benefits of long enough, future-generation reads. Here, we suggest WhatsHap, a novel dynamic programming approach to haplotype assembly. It is the first approach that yields provably optimal solutions to the weighted minimum error correction (wMEC) problem in runtime linear in the number of SNPs per sequencing read, making it suitable for future-generation reads. WhatsHap is a fixed parameter tractable (FPT) approach with coverage as the parameter. We demonstrate that WhatsHap can handle datasets of coverage up to 20x, processing chromosomes on standard workstations in only 1-2 hours. Our simulation study shows that the quality of haplotypes assembled by WhatsHap significantly improves with increasing read length, both in terms of genome coverage as well as in terms of switch errors. The switch error rates we achieve in our simulations are superior to those obtained by state-of-the-art statistical phasers.